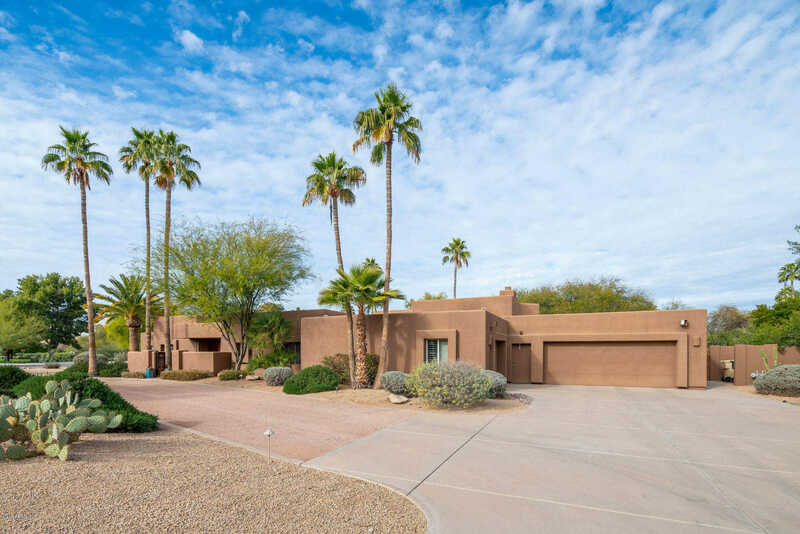 Welcome to the Perfect Paradise Valley opportunity! Incredibly convenient location in a very private & quiet neighborhood. Split floor plan offering the space for everyone & everything but in a manageable design – for those looking to ”rightsize,” with the ideal SQFT that doesn’t sacrifice functionality or individual privacy. The property features a private office, split Master Bedroom with adjoining exercise/massage room and large Master Bath with ample His & Her’s closets. The Kitchen/Great Room features a wet bar, Billiards, Media Area, and eat-in dining all in one with clear views to the Backyard/Pool and side private courtyard w/ fireplace. Split guest bed/2nd office w/ bath, 2 additional bedrooms with work/study area, and a 2 car garage + sep. 1 car garage with tons of storage! Directions: South on 52nd ST, Left (east) on Tomahawk Trail, Right (south) on Via Buena Vista, Left (west) on Via Buena Vista to property on immediate NW corner. Approximate size: 43892.00 sq. ft.